Shakespeare’s magical tale of fairy mischief has been beautifully adapted for young performers by Marieka Peterson Greene. The Bard’s story of mistaken identity, love and laughter comes alive with a liberal sprinkling of poetry, humour and music. 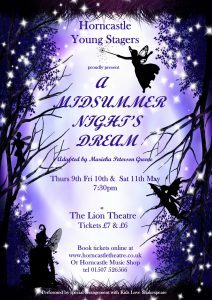 The play gives a modern and delightful spin as the story of magical fairies and mortals unfolds. Follow our quartet of lovelorn humans, prankish Puck, fairy King Oberon and Queen Titania who finds a most unusual true love! Don’t miss this enchanting version of Shakespeare’s classic tale where all’s well that ends well and rightful loves are restored. A Midsummer Night’s Dream is performed by special arrangement with Kids Love Shakespeare.